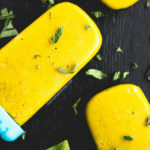 Pour into six 2-ounce popsicle molds (my 2-ounce molds hold about 1/3 cup liquid each). If you have extra liquid, just drink it like a smoothie! Freeze for at least 4 hours. Run the molds under hot water for 10-30 seconds to release the popsicles from the molds. Enjoy!